Fill and preheat the SousVide Supreme water oven to 145F/63C. Put the pork belly into a cooking pouch and vacuum seal. Submerge the pork belly in the water oven to cook for 36 hours. After 36 hours, remove the pouch and quick chill, submerged in ice water (half ice, half water) for 30 to 40 minutes, then refrigerate for at least 8 hours. Combine all ingredients in a small bowl, cover, and refrigerate until ready to serve. Fold each biscuit in half to resemble a half moon and place each on an individual parchment paper square; lightly brush the biscuit with oil. Once the steamer is ready, place each biscuit (with the parchment paper still attached) in the steamer. Make sure to leave plenty of space between biscuits, as they will expand quite a bit. 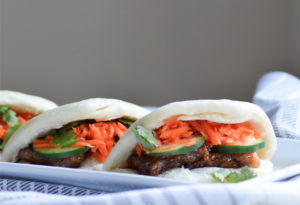 Gently split a steam bun in half with the back of a spoon, add 1 or 2 pork belly slices to each. Top each with a couple of slices of cucumber, a couple of spoons of carrot slaw, and some cilantro.